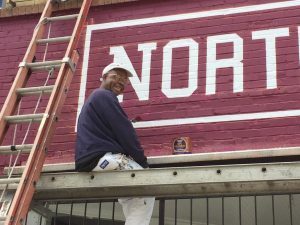 The signs directing you to the North Campus and the Black History drawings on the walls of LeRoy’s Barbershop are just a few examples of Harold “Bambino” Davis Jr.’s free-handed flair that can be seen all over St. Louis’s north side. And despite Bambino’s recent passing, those signs, murals and public artwork will continue to be a lasting legacy of the artist and the man who impacted so many in the community. Davis was 62 when he passed away after a long battle with throat cancer. Loved ones gathered at the African Village Church to talk about the friend, family member, artist and activist. Neighbors from the O’Fallon Park neighborhood where he lived, classmates from Beaumont High School where he graduated from and frat brothers from Kappa Alpha Psi were in attendance. A lifelong resident of St. Louis, Davis was 6 when his parents moved their 13 children from the Carr Square Village neighborhood to O’Fallon Park. A gifted artist who studied art at University of Missouri Columbia, Davis specialized in outdoor signs for a living. He amazed people with his ability to hand-draw perfect and evenly-spaced lettering. In addition to painting signs and the interior and exterior of homes, Davis was also a creative artist. He designed T-shirts, drew portraits of prominent African-Americans and created murals of colorful jazz singers and powerful Black History figures. A mural Davis created depicting Malcolm X, Rev. Dr. Martin Luther King Jr., Frederick Douglass and Louis Farrakhan adorned the walls of LeRoy’s Barbershop for years before the building was demolished in 2007. Owner LeRoy Bryant, who knew Davis for 40 years, said the artwork sparked conversation. Davis’ sister, Cheryl Bush, said it was important to him to also use his art for a greater purpose. Davis had been using his talents and abilities to help the community since he was in grade school, according to childhood friend Ronnie Ross. Ross said he and Davis were 6-years-old when they formed Operation TOUGH, which stands for Toward Organizing Unity Growth and Humanity. “We were cleaning up the alleys and raising money to start a Little League,” Ross said. “We used to get into a lot of organizing stuff. We were part of ACTION (Action Committee to Improve Opportunities for Negroes) with Percy Green, an offshoot of the Black Panthers. Billy Davis agreed. He shared a black-and-white snapshot of himself and Davis at a student protest at Mizzou in 1975. They are both engaged in a sit-in to bring attention to the lack of black faculty and they are proudly displaying protest signs made by Davis. Davis’ son, Harold Davis III, said he received Black History lessons from his dad. He recalls Davis Senior showing him documentaries about historical figures. 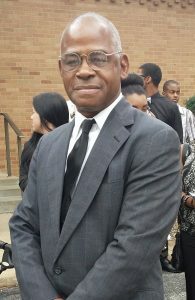 He said his father was “big on” Louis Farrakhan and was a member of the Nation of Islam. Davis III said his father never married and has a daughter named Felicia living in Ohio. Bambino’s only son said he will always remember his father’s passion for his work, his zest for life and his love of family. Cheryl Bush, Davis’ sister, said his positive spirit helped him during his illness later on in life. Davis III, who is a chemical operator living in Spanish Lake, recalls the man with the deep booming voice who used to take him on sign painting jobs.